Happy National Children’s Dental Health Month! What, you didn’t know NCDHM was February? During this time, dental professionals, healthcare providers, and educators all come together to talk about the best ways to take care of Waco’s littlest smiles. 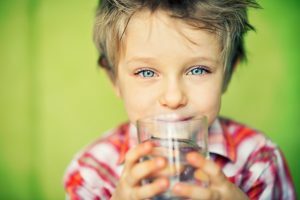 This year, the slogan is, “Choose Tap Water for a Sparkling Smile.” The team at Premier Family Dental, the home of your children’s dentist in Waco, TX, is going to talk a little more about NCDHM, and how you can use it to help your child’s smile. So out of all the possible slogans the American Dental Association (ADA) could have put on their poster for NCDHM, why did they choose to talk about tap water? Tap water typically has fluoride, which helps your child’s teeth fight cavities. Bottled water, on the other hand, does not. Unlike sodas or juices, water is not packed with added sugar, so your child can drink as much as they want whenever they are thirsty and not harm their teeth. Also, it rinses the teeth of plaque and food particles, making it the next best thing to brushing. The first point is especially important, as an overreliance on bottled water has actually increased the rate of cavities in children. This is because they are getting less fluoride in their diet, which is an important part of preventing tooth decay. If it’s a choice between bottled or tap water, always choose tap! One of the main purposes of NCDHM is to get the people around your child to talk about why they should be taking care of their teeth. You’re probably already doing this, but we’re sure a little extra help is always appreciated. That is why the ADA has made a variety of worksheets and games for your child intended to get them thinking about their teeth (available in both English and Spanish). They should help them understand how their diet affects their teeth, as well as how to properly brush. They will reinforce everything you are already saying to them, and help your child realize why taking care of their teeth is so important. Of course, when it comes to your child’s smile, you are not alone. Dr. Rick Cofer is a fantastic resource when it comes to your child’s oral health. Not only can he clean their teeth professionally, but he can also talk to your child about why taking care of them is so essential. Sometimes, simply by hearing the same thing from a different person, a child will start to listen. You can also talk to him about ways you can help your child at home, which dental products they should use, and basically use him as a guide for anything involving their teeth. He is ready to help, and will always make sure you know how to take care of your littlest smile. By talking to your child about their oral health at an early age, you are helping them form essential habits that they will use to take care of their teeth their entire life. The better experience they have with dental care now, the more likely they will keep it up, creating a cycle that will help their smile be healthy for years to come. That is the true goal of NCDHM. If you have any questions about your child’s dental care or want to schedule their first appointment for 2017, please give us a call today. by: Dr. Rick Cofer at March 8, 2017 .